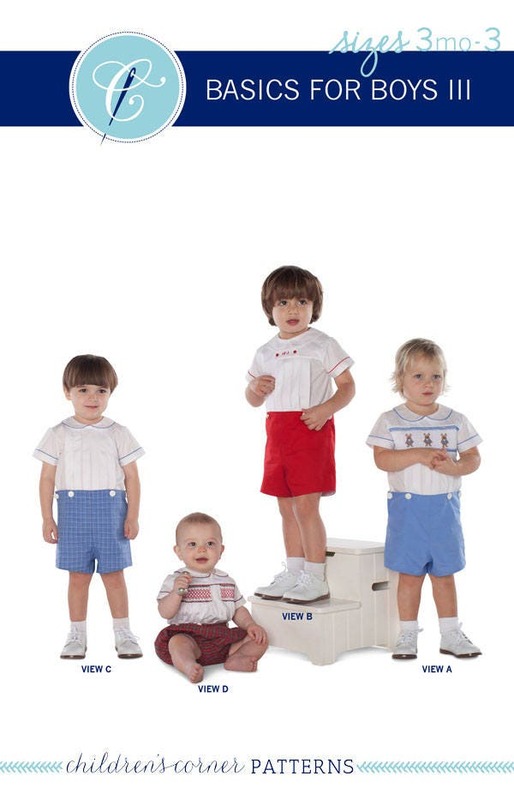 Basics for Boys III is a collection of CC's classic, young boys patterns – David, John, Michael, and Wright. 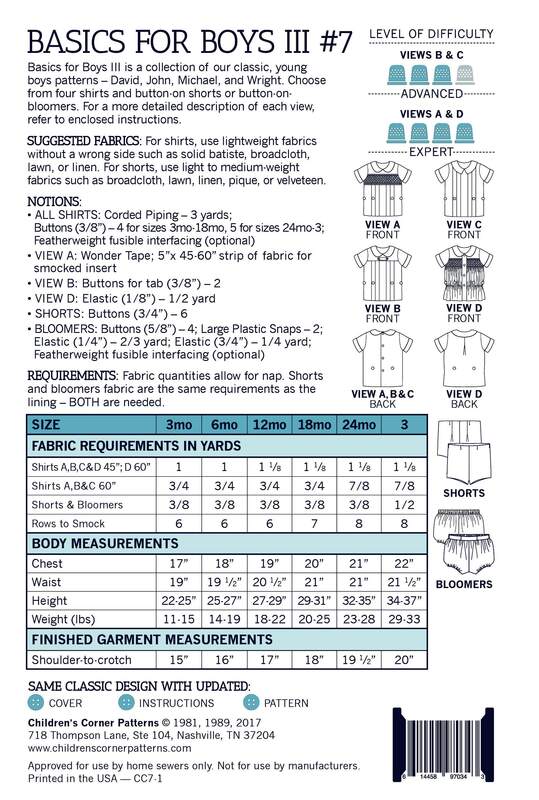 Choose from four shirts and button-on-shorts or button-on-bloomers. All of the shirts can be worn tucked-in with button-on shorts or on the outside of elastic waist shorts. The shirts have a piped Peter Pan collar or a pointed collar and a straight, short sleeve with a cuff. VIEWS A, B & C button in the back. VIEW A has a yoke with a smocked insert and pleats under the smocking. VIEW B has a yoke with pleats and is embellished with a tab. VIEW C has pleats from shoulder to hem. VIEW D buttons in the front with a yoke and smocking. The shorts button on with side plackets. The easy-to-make bloomers have an elastic casing in the back with buttons on the front and sides. Suggested fabrics: For shirts, use lightweight fabrics without a wrong side such as solid batiste, broadcloth, lawn, or linen. For shorts, use light to medium-weight fabrics such as broadcloth, lawn, linen, pique, or velveteen. Very pleased with my purchase and the Seller's service. Pattern arrived quickly and well packed. As described, thank you.